Will Genia and David Pocock are the leading contenders for the John Eales Medal. 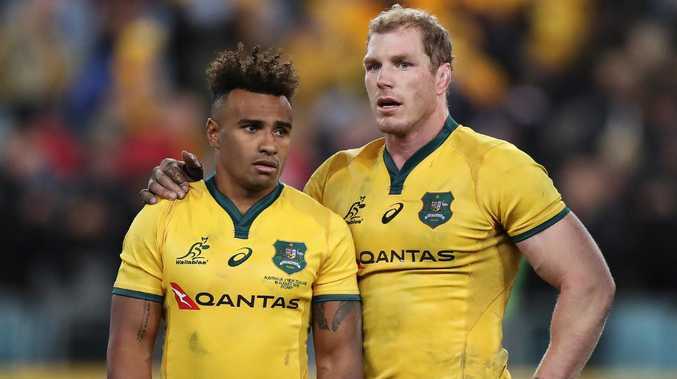 WILL Genia is a slight favourite to deny the inspirational David Pocock and land his first John Eales Medal as a raft of big-name Wallabies jostle for Australian rugby's highest individual honour. Pocock, two-time winner Michael Hooper and backline aces Kurtley Beale and Bernard Foley loom as Genia's most serious challengers at Friday night's awards ceremony in Sydney. Pocock has been Australia's standout performer since returning from his 2017 sabbatical but only played eight Tests during the voting period after missing last year's spring tour as well as two outings this season with a neck injury. The champion backrower could well claim a second medal but will need to dominate the voting this year to pip Genia or Hooper, Australia's most consistent performers in a lean 12 months during which the Wallabies have won just five of 13 Tests during the polling period for the 2018 awards. Genia was Australia's best in multiple matches, often in beaten sides, with the halfback general sorely missed in the Wallabies' series-deciding loss to Ireland in Sydney with a broken arm. Tellingly also, Hooper's only absence from the 13 voting Tests was the Wallabies' shock 23-19 loss to Argentina on the Gold Coast last month. Australia’s Will Genia passes the ball during the Test against South Africa in Port Elizabeth. Hooper would have polled well in most of his other appearances, leaving the skipper very much in contention for a third medal to go with his major gongs in 2013 and 2016. Beale, while not at his brilliant best in 2018, was the only player to start in all 13 of Australia's Tests during the polling period that started before last year's spring tour. While relegated to the bench for three Tests against South Africa and Argentina before returning to guide the Wallabies to a stunning comeback win over the Pumas in Salta this month, Foley was another mainstay for coach Michael Cheika. Israel Folau, the only three-time John Eales Medallist, played only seven Tests after also missing last year's spring tour as well as two matches in 2018 while injured. Dane Haylett-Petty, who finished this year strongly after taking Folau's fullback spot, shapes as the big outsider but was another of the stars not to feature on last year's four Test tour of Japan and Europe. Wallabies star Israel Folau poses after winning the John Eales Medal in 2017.